There's a new old Star Fox coming to the Nintendo 3DS, a remake of the Nintendo 64 classic that, according to Nintendo, "ups the Star Fox mania" with a pair of new features, seemingly designed for Star Fox maniacs. It's not the improved take on Star Fox 64's multiplayer mode, though that's in the 3DS update and playable over a local wi-fi connection. There are new multiplayer modes and weapons in Star Fox 64 3D. It's also not the graphical overhaul of the Nintendo 64 original. "The new Score Attack Mode allows the player to revisit any planet and play for a high score on that level." "New features also allow first-time players to enjoy the excitement of Star Fox." Crazy. Just crazy. 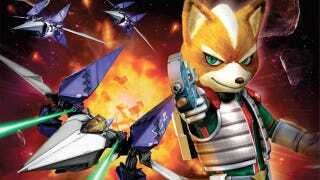 Star Fox 64 3D doesn't have a firm release date yet; Nintendo says 2011. The Nintendo 3DS game wasn't playable during this week's event in New York City—even though it was playable at E3 2010—so we don't expect it to be among those launch window games due by June.